The objective of the Technical Specifications Content Guide is to specify the evidence-based technical requirements and steps to be followed for the practice of each behavior to achieve the desired impact: reducing the risk of negative consequences caused by Zika during pregnancy. 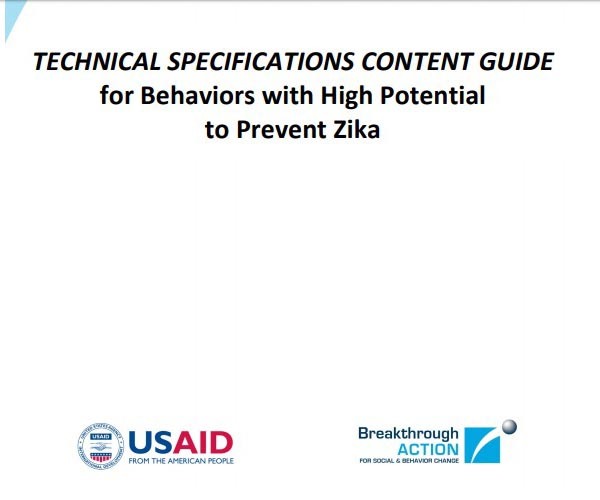 This guide accompanies the Zika Prevention Behavior Matrix, which analyzes the efficacy and feasibility of 7 behaviors with high potential to prevent the transmission of Zika and Congenital Zika Syndrome, based on a review of existing literature, data, and consultation with implementing partners of the USAID Zika response in several countries of Latin America and the Caribbean. One of the findings of this analysis has been the need to be more specific in the promotion of prevention behaviors to maximize the potential effectiveness of each behavior. This level of specificity requires more detailed technical information and specific steps to facilitate the adoption of the desired behavior.